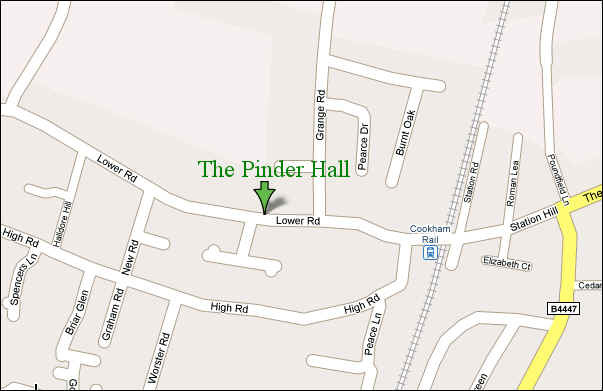 The Pinder Hall is located in Lower Road, Cookham Rise, SL6 9EH which is the main road running through the Village. It is about three minutes walk from the station, cross the level crossing and it is around six hundred yards on the right hand side of the road just past the Post Office and Grange Road. "The village of Cookham has been enriched by the erection of a magnificent hall, provided through the generosity of a well known local resident, Mr H Pinder-Brown. Standing in a prominent position on the main Cookham Rise road, it not only fills a long felt want in the neighbourhood but forms a handsome addition to the architecture of the village." The report goes on to say that the architect was Mr A Vernon Kislingbury of Cookham and the building was erected by Messrs. Cripps and Green Ltd of Maidenhead "upon whom it reflects good credit" and the electrical work was carried out by Mr T G Church of Cookham. The building was named at a reception in the hall by Lord Meston as "The Pinder Hall" in memory of Mr Pinder-Browns late wife, who for many years was held in affectionate regard by all the village. The report goes on to say; "Lord Meston, who was given a warm reception, said those of them who had to walk down Cookham Rise in the morning only a short time since recalled there was a derelict builders yard; on it there had risen up this beautiful building in which they were now sitting." Lord Meston went on to say that Cookham now had a centre where young men and maidens could come and dance in the evening and middle-aged philanthropists and old fogies like himself could troop in and tell each other that the world was going to the dogs. So from the beginning the Pinder Hall has provided social outlets for the village. In the early days before the War there are reports of Monday afternoon badminton, of a Keep Fit class for young ladies, who wore a uniform of blue silk dresses with peasant style lacing in the bodice. Also of a Concert for charity with Joyce Grenfell. In fact the hall was used for very much the same purpose in those days as now. At the outbreak of war in 1939 the hall was requisitioned to provide a school for LOC evacuees from Fulham. The Hall was released in 1944. It was in this year that Mr Pinder-Browne handed the deed of entitlement of the Pinder Hall to the Vicar of Cookham, Reverend Hayward Browne, vesting the property in the trustees "for the use and enjoyment of the inhabitants of Cookham and adjoining districts". Plans for a regular cinema show started in 1945, but it was cancelled after six weeks. 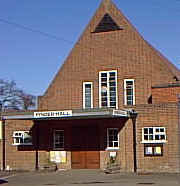 In 1957/58 the Hall was used by Holy Trinity school while their own school was being extended and modernised. So Pinder Hall has continued. Its Management Committee has had to contend with rising prices while attempting to keep the letting fees down to a minimum, but it looks like the Pinder Hall can do a good job for many years to come.